Cracker Barrel whips up new Country Fried Turkey as part of their limited-time menu for the 2018 holiday season at participating locations. The seasonal dish features hand-breaded turkey filets that are deep-fried until crispy and then topped with a creamy herbed pan gravy. It comes served with new Green Bean Casserole, a side of your choice, some cranberry relish, and a choice of either buttermilk biscuits or corn muffins. - Green Bean Casserole - Green beans in a savory mushroom sauce, topped with house-made fried onion straws. - Fresh Baked Pie Slices with New Salted Caramel Ice Cream - A slice of either Pecan, Chocolate Pecan, Apple Pecan Streusel, or All-American Apple (No Sugar Added) Pie topped with new salted caramel ice cream. - Southern Praline Latte (hot or iced) - Espresso, milk, and Southern praline candy flavors, topped with whipped cream, salted caramel drizzle, and a brown sugar-glazed pecan. 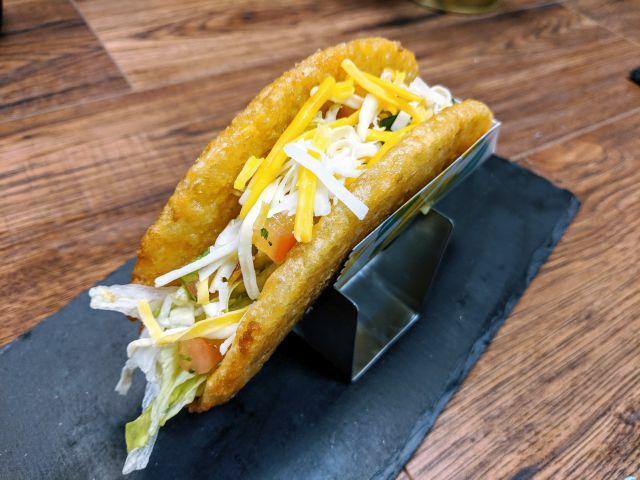 The limited-time menu items are available through December 30, 2018. 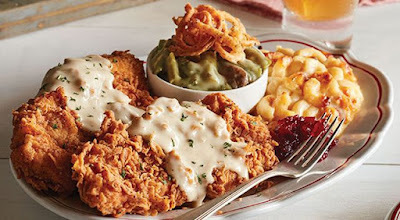 Additionally, only on Thanksgiving Day, Cracker Barrel will be serving their Homestyle Turkey n' Dressing Meal. The meal includes sliced turkey with gravy, a sampling of sugar-cured ham, sweet potato casserole with pecans, cranberry relish, a choice of a side, a choice of either buttermilk biscuits or corn muffins, a refillable beverage, and a slice of pumpkin pie. Photo via Cracker Barrel Old Country Store.